How papyrus paper is made, where papyrus comes from, what it was used for and the different types of papyrus available. Papyrus - the world's first paper! Papyrus is made from the Cyperus papyrus plant which grows well in the Nile's fresh water. It grows in water up to about a meter deep and can reach four and sometimes nearly five meters in height. The stem at its broadest can be fifteen centimeters across. The stems of the Cyperus papyrus plant are triangular in shape which helps to give it the strength to withstand high winds without breaking. The ancient Egyptians started making paper from the papyrus plant over five thousand years ago and became one of Egypt's major exports. The modern word "paper" originates from the word "papyrus". Egyptian rulers realizing the importance of Papyrus, made its production a state monopoly, and guarded the secret of Papyrus jealously. The ancient Egyptians appeared to have used papyrus in so many ways. We know they made paper from papyrus but they also used it to make sandals, wove it into mats, baskets and fencing, made rope and also used parts of the plant for food as well as a medicine. The reeds were bundled together to make boats and dried to make fuel for fires. There are undoubtedly other uses that the ancient Egyptians found for papyrus. There was no real competitor to Papyrus until, in AD 105, a Chinese court official called Ts'ai Lun invented paper. With the introduction of paper making into Egypt, the production of Papyrus rapidly declined, and eventually stopped. Papyrus was cultivated and used for writing material by Egyptians until the eighth and ninth centuries A.D. when paper from other plant fibers were utilized. By the third century A.D. the less expensive vellum, or parchment, had begun to replace papyrus in Europe. Unfortunately the art of making paper from papyrus was lost until, in 1965, an Egyptian scientist discovered the old lost secret of Papyrus hand-making. 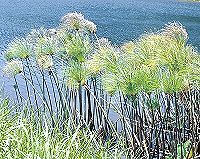 Dr. Hassan Ragab reintroduced the papyrus plant to Egypt from the Sudan and started a papyrus plantation near Cairo on Jacob Island. He also researched the method of production. Unfortunately, the ancient Egyptians left little evidence about the manufacturing process. There are no texts or wall paintings and archaeologists have failed to uncover any manufacturing sites. Thankfully, Dr. Ragab finally figured out how it was done, and now papyrus making is back in Egypt after a very long absence. Thanks to Dr. Ragab, many tourists to Egypt are able to purchase papyrus paper containing hand painted scenes and figures copied from original paintings on tomb walls. Today the most important uses of papyrus are that of ecological resources. The rhizomes of the plant prevent soil erosion and trap polluted sediments. A study from 1997 showed that Papyrus is useful in wastewater treatment. The study showed that papyrus reduced the amount of nitrogen and phosphorus in wastewater by more than fifty percent in seven to eight months. "papyrus paper" - "what is papyrus" - "how is papyrus made" - "Egyptian papyrus"
Copyright © 2008 - Egyptian-papyrus.co.uk. All Rights Reserved.